Is it alright to plant Grape Hyacinths in the spring? Everything I read says that Grape Hyacinths need to be planted in the fall. I just purchased three large pots of grape hyacinths that are currently in bloom. 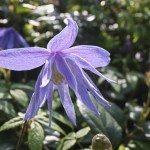 Is it ok to plant them in the ground now even though it is springtime, and how deep do I plant them since they are plants, not bulbs. Planting is usually performed in fall for spring blooming plants. That does not mean you can't go ahead and plant them now, only that you may not see any blooms until the next season.